37 in numbers. That’s the number of case studies we’ve shared with you this year. It sounds really impressive. We’ve covered a lot of topics and created a ton of unique content. It’s been a lot of fun sharing those contents with you time by time, but now it’s time to highlight the best out of all. 1. How Sharekhan increased leads count through a training campaign leveraging digital marketing? Sharekhan was founded in 2000 and now it is ranked 2nd largest stock broker portal by their strong presence over the web. This case study uncovers how Sharekhan became the second largest stock brokerage portal by using digital marketing platforms. 2. How HubSpot used Twitter to increase sales by 150%? HubSpot’s objective is to generate leads, engage existing followers, increase sales conversion rate and improve ROI. In this case study we share how Hubspot turn the website into a magnet to attract the customers by creating awesome content and optimizing it for search engines. 3) How Fashion and You lost its No.1 position in Indian fashion e-commerce industry? In 2009, Fashion and You was launched in India that changed the way Indians used to shop for fashion wear. This case study outlines how Fashion and You is regaining its lost glory and making customer’s experience a happy one. 4. How HealthKart reached 500K customers in Just 2 months using Social media marketing? Healthkart.com is a big online marketplace in the Health care industry in India. This case study concludes the business objective of HealthKart and explains how HealthKart drove the social reach and referral sales to grab a huge customer base through its various social media platforms. 5. How Xiaomi became most valued startup across the world in just 5 years? Xiaomi started in 2010 became the world’s most valuable technology start-up in December 2014. The most interesting fact is that Xiaomi is also called the “Apple of China”. This case study summarizes how Xiaomi has a great advantage of promotion through social media and online forums. How it created a sensation and was being talked everywhere. 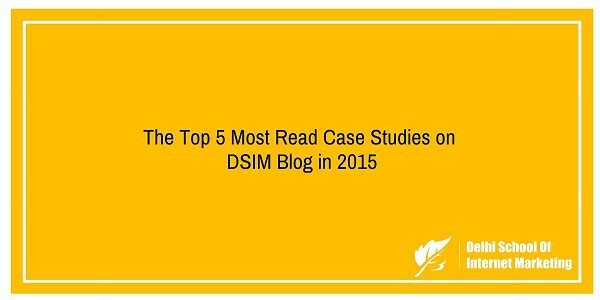 Well, that’s the wrap up of the top 5 most read case studies on DSIM blog in 2015. This was a big year for DSIM and we have no plans of slowing down in 2016.